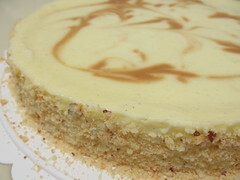 Vanilla-Hazelnut Cheesecake - Do You Know The Muffin Man? Notes: The hazelnut brittle never turned into a paste for me, even after adding a bit of Frangelico. I think I cooked the sugar syrup too long so the caramel was too hard. I couldn't find Neufchâtel cheese, so I substituted with half quark and half cream cheese. This was the first time I used real vanilla bean seeds; I can't really detect the flavour though.